Spaceborne Computer is first step in helping NASA get humanity to Mars. The world needs more scientists like Dr. Mark Fernandez. His southern drawl and warm personality almost make you overlook the fact that he’s probably forgotten more about high-performance computing (HPC) than you’ll ever know. 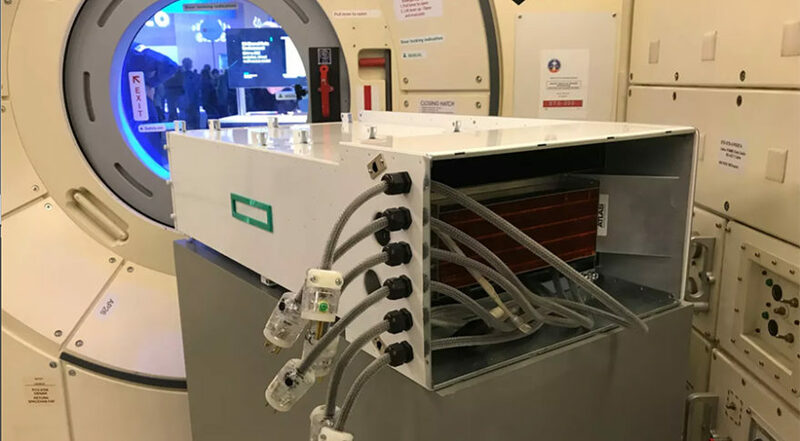 The Spaceborne Computer is currently flying aboard the International Space Station to prove that high-performance computing hardware can survive and operate in outer space conditions. Courtesy HPE. Fernandez is the Americas HPC Technology Officer for Hewlett Packard Enterprise (HPE). His current baby is the Spaceborne Computer, a supercomputer that has spent more than a year aboard the International Space Station (ISS). In this time, the Spaceborne Computer has run through a gamut of tests to ensure it works like it’s supposed to. Now, it’s a race to accomplish as much as possible before the machine is brought home. The Spaceborne Computer’s history extends well before its launch to the ISS. In fact, Fernandez explains that the project began about three years prior. When astronauts send and receive data to and from Earth, this information is moving at the speed of light. In the ISS, which is 240 miles (400 kilometers) away from Earth, data transmission still happens very quickly. The same won’t be true when humans begin our journey into the rest of the cosmos. To get ready for these kinds of tasks, the Spaceborne Computer has spent the past year performing standard benchmarking tests in what Fernandez calls the “acceptance phase.” Now that these experiments are done, it’s time to get interesting. For traditional supercomputers, powering and cooling the machine often represents a huge cost. This isn’t true in space. The cost-neutral aspect of the Spaceborne Computer allows HPE to give researchers access to the machine for free before it must return to Earth. One of these experiments, announced at SC18, concerns Entry, Descent, and Landing (EDL) software. While Fernandez is delighted that his machine will be able to test important innovations like this, he seems dismayed by all the science he won’t be able to do. The Spaceborne Computer will soon be brought back home by NASA, and he’s doing what he can to cram in as many important experiments as possible. Fernandez’s attitude speaks volumes about the mental outlook we’ll need to traverse the cosmos. He often uses the term “space explorers” in place of “astronauts” or even “researchers.” It’s a term that cuts to the heart of what scientists like him are attempting to do.